I have just returned from this hotel with my family and friends and cannot complain at all about the hotel. the staff were extremely friendly and nothing was too much trouble for them. The hotel itself was very clean you always seen an army of cleaning staff around the hotel every day. The food was plentiful and had variety, couldn't complain at all about this either. I would definitely go back and would recommend to others. Michale hotel rep for Thomas Cook was very helpful and welcomed anyone even if not traveling with their company - not pushy at all. Luckily we were only on the first floor, room number 106 and it was the biggest hotel room we had ever stayed in with a fully equipped kitchen. It was nice to have a big fridge included even though we were all inclusive. Neither the beds nor the bed settees were comfy enough to have a good nights sleep like home but the sheets and pillows were clean and that was all that mattered to me. We woke to find one or two cockroaches in the room but they were never really a major problem and after all you are in Gran Canaria! But the view from our room was fantastic and made up for any creepy crawly. I have never seen a blue sky matched with blue sea like it! It was lovely. Lola our maid came round every two days to clean and she changed our linen on Saturday. She changed all our towels regardless whether we needed them changing which I thought was really nice of her. The army of cleaners could be seen around the hotel every day constantly washing and sweeping terraces, mopping and polishing floors and cleaning round the pool area. The waiters and waitresses in the dining room basically hover over your shoulders ready to swipe your dirty plate away to keep the place looking clean. The breakfasts consisted of various cereals, white and brown bread to toast, jam, honey, marmalade, rolls, waffles, bacon, scrambled, boiled and fried eggs, beans, fruits, salad, cold meats and even chips! Lunch on offer was usually chips, burgers, sausage, salad, fruit, rice, meat dishes and breads. Dinner was usually meat such as pork, turkey and chicken, mash potatoes, boiled potatoes, selection of veg, nuggets, fish, rice, beefburgers oh and chips! The chinese food night was lovely, my favorite is sweet and sour chicken so I was really pleased. The barbecue night was great too and you could see the two guys cooking steaks, chicken and sausage outside. The food was plentiful and constantly being checked on by kitchen staff to replenish whenever needed. I found the variety of food really nice, but then I like most foods whereas if you are not keen on different flavours other than standard meat and two veg or chips kind of meals then you might struggle sometimes to put things together so mealtimes might get tedious for you. Pete the entertainer was great with the kids, they really liked being around him. He did try to get most of the children to join in with pool games or football etc in the afternoon but to be fair he is limited with resources and time. Music is played around the pool in the afternoon and it is usually the same songs so you'll think it's brill if you love Lady Gaga! Karaoke every night does get a bit much as others have said but to be fair if there aren't many adults with the confidence or the voice to get up and have a go you will end up with the same kids murdering California Gurls or Lady Gaga songs! Still it is a self service bar after all so just drink and sing a long! The shows in the evening didn't seem to last long enough either only seemed about 40 minutes or so. The guy who does the Eagle show only seemed interested in trying to get kids to have pictures with his birds at 10 euros a time. You wouldnt mind but it is just a photo not in a frame or anything special and he charges for more than one person in the photo at a time! Needless to say he didnt seem like he had a roaring trade after the show for photos, wonder why? We did enjoy the Bingo sessions though and won seven times in our two week stay! The pool area was nice and clean and the pool tables were very popular with the kids. If you want a decent sunbed then you will have to join the sunbed brigade from 7am if you want your favorite spot leave it any later than 8.30am and you will have to make do with the patio chairs. Michael the holiday Rep is very knowledgeable about the area and he offers many trips at reasonable prices. He is always around at the hotel so if you do have a problem there is someone on hand to help. As someone has already pointed out one negative to this hotel is the lack of air con in the rooms. We did have the two fans going constantly through the day and night we could actually feel it was cooler outside on the terrace than in the room! But the bedroom fan was noisy but you had no choice but to have the fans on. I envied the people who had a balcony (I think these were rooms in the 200€s and 500€s) and could leave their doors open at night to have a bit of a breeze. We never expected Las Vegas shows neither did we expect five star cuisine at this hotel however we did get a clean hotel, friendly staff and a lazy refreshing break in the sun. Our two children met lots of lovely friends and we really enjoyed our holiday here. Have stayed at this hotel twice before and it did not disappoint. Asked for a room on 2nd floor with a large balcony and got exactly that. Entertainment was not quite up to the same standard as last year but as the hotel now takes English and Scandinavian people together they have to cater for everone's tastes. Food good and staff friendly. Excellent value for money." Having just returned from the Altamadores Apartments my wife and I feel we have to write a positive reveiw about the place. The staff were very welcoming, helpful and friendly. The apartments were immaculately clean with excellent maid service. Food was very good for adults and kids alike. Entertainment was good most nights. I wouldn't think twice about going back to this apartment complex and my kids agree. All in all we had a wonderful holiday. We stayed in the Altamadores in June 2010. We were not disappointed at all. The hotel was lovely and pool area immaculate. We didn't have any difficulty in getting beds by the pool although in June it would probably be a little quieter. The food was varied and the 2 weekly barbecues were lovely. All food was well cooked and no complaints at all. The hotel staff were fantastic and all made a big fuss of our 13 month old baby which was lovely. Everyone from the receptionist, the restaurant staff to the handy man were very welcoming and couldn't do enough for us. Yes the hotel is a bit of walk to the beach and the Europa centre but not too far and taxies are really cheap. Couldn't recommend this hotel more highly. Would definitely book again if we return to Gran Canaria. We stayed in the altamadores for a week from the 24th may 2010.The apartment was clean and spacious,we had a lovely terrace with a fantastic view of amadores beach.The apartments are situated quite high up on a hill,alright to walk down to the beach but better to get a taxi back up,it only costs about 3 euros.All-inclusive is from 11am till 11pm,bar then closes and then unable to buy any more drinks at the bar.Most people would stock up on drinks about 10 mins before bar shuts and take them out to pool area.We met a fantastic crowd and we would all get together around the pool after bar closed.Would advise anyone who likes to retire early to bed not to take a room around pool as it could be bit noisy with people talking and singing as they close the bar doors. The all=inclusive bar was self service and that included the spirits and wines also which is quite unusual but stopped any queing. Food was average but you would always find something that would appeal to you. the altamadores apartments were fantastic. The were to a very high standard of cleanliness in all aspects including the rooms, resturant and pool area. the maid service was excellent, the resturant and reception staff were very friendly and helpful.There was an excellent selection of food on offer to suit all and available throughout the day.The whole package was great and i will definately be returning. the only improvement that could be made would be on the entertainment. the last 2 nights were excellent with Jake Sullerman, Chris Mooney who were very talented singers and created a very good atmosphere. all in all a great holiday. Very disappointing - despite reasonable reviews. The apartments - set up on a steep hill - were adequate. Please note there are no hairdryers - and the TV is coin operated. THe food (we stayed all inclusive) was dreadful. I think they need to get to grips with the buffet cart - as the hot food was always cold and the salad was luke warm! They forgot to switch the soup urn on one day - and I found cold soup with a white fat skim settled on the top! Lovely...! Suspicions of "recycling" going on - grilled meat would often be reincarnated in a cream sauce the next day - further resurrected as curry the day after...? Drinks were left on the bar to help yourself - which was novel - but avoided the hassle of queues. This was also convenient for the children who could just help themselves at the soda fountain. We have just returned home from a two week holiday at the Altamadores and would strongly reccommend this holiday to anyone as it suits anyone of all ages. The rooms were absolutely spotless and were cleaned thoroughly six out of seven days. They were very spacious especially with there only being the two of us and had all the necesseties such as a fridge, cooker etc. The hotel is situated outside of the main centre but is very nice not having the hustle and bustle at night times and is only a 15min walk from a lovely beach. 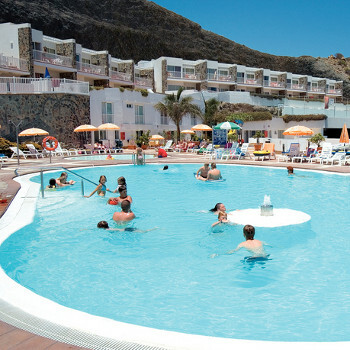 The all inclusive basis proved to be the best otption for us and overall it was very good. However, the evening meal was not of a particularly high standard compared to the breakfast and lunch snacks available but the Europa Centre and Puerto Rico centre were so close in a taxi and had lots of nice bars and restaurants. The staff were all very friendly and entertainment was provided both day and night six out of seven days so there was plenty going on to keep eveyone amused. We would strongly consider returning to this hotel in the future.